Don’t forget, Thursday night sailing begins THIS week! 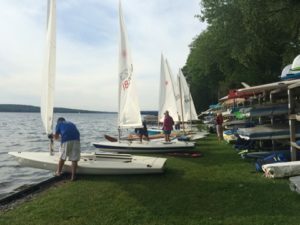 If you have a passion for sailing and are looking for a fun, non-competitive sailing environment, join the Thursday night sailing group! Many arrive around 4:30 p.m. and often sail until dark. It doesn’t matter what type of boat you sail or what level you are, whether you want to sail for fun or improve your sailing techniques – all are welcome! We’re even happy to assist with rigging to help get you started. if you need help rigging your boat. Looking forward to seeing you there!